Some jobs shown have "before & after" shots. Others have in-progress or completed shots only. 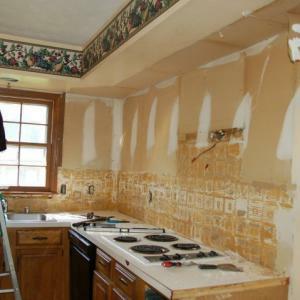 As you can tell, this farmhouse definitely needed some work! 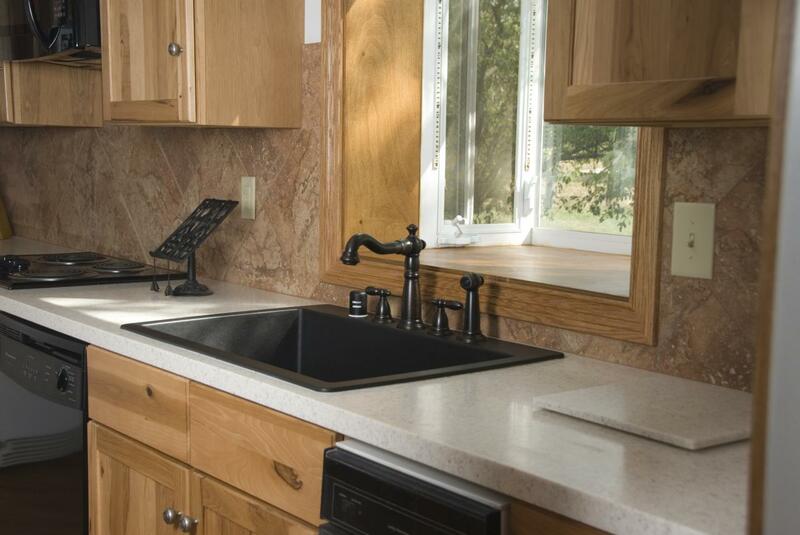 Solid surface countertop has a fleck to match the color of the cabinets. 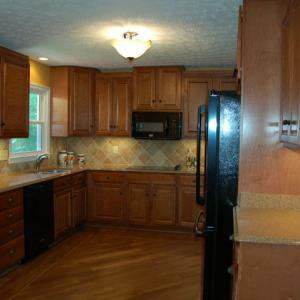 Opened up by taking out the old dark hanging cabinets. 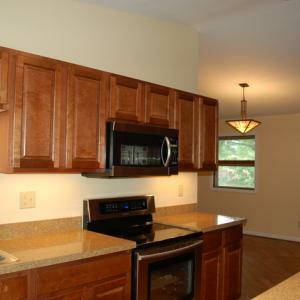 Almost a galley-style kitchen, low-hanging dark cabinets made the kitchen feel shut off from the dining/family area. 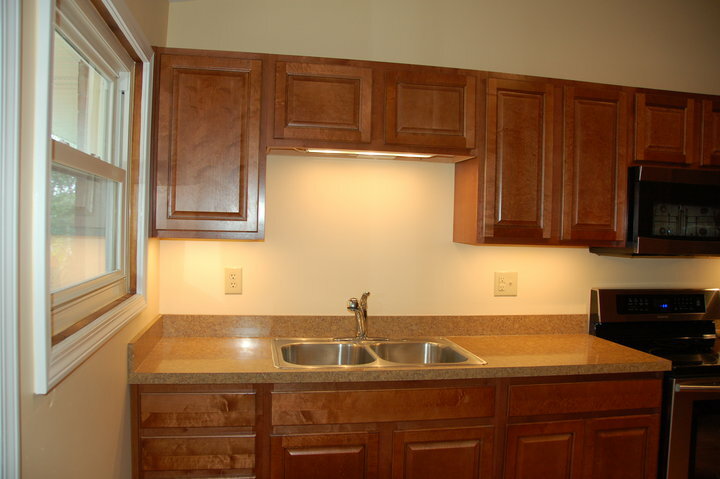 We got rid of those cabinets and lightened things up. 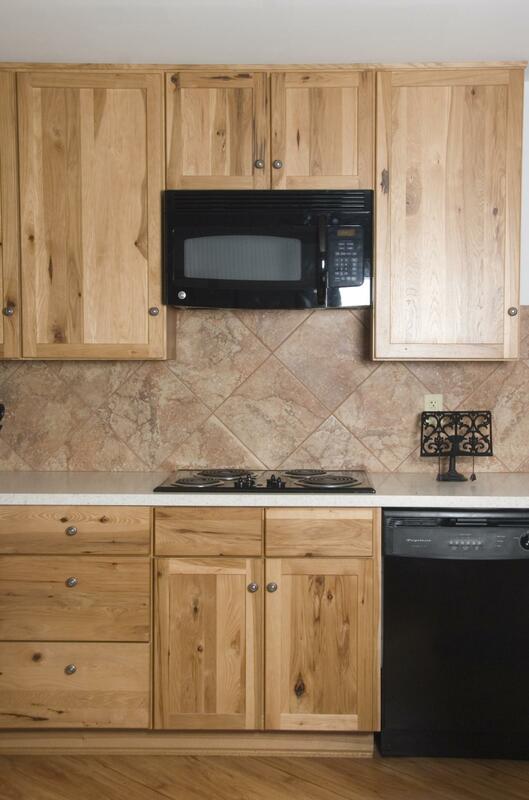 Dynasty cabinets in American country style "Marion" in Rustic Pecan with an "Autumn" stain. 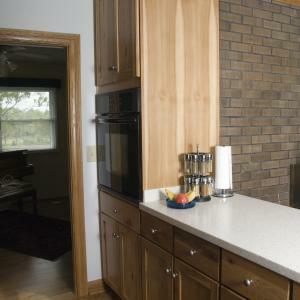 Porcelain tile by Daltile on a diamond set. 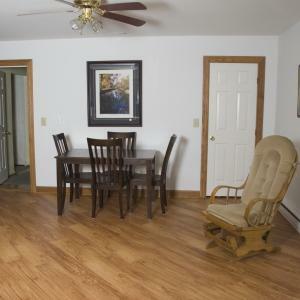 This is a hard-working farmhouse on a horse farm that had to live up to the demands of daily living, muddy boots, pets, and owners with a desire for warm, comfortable style! Karndean luxury vinyl plank flooring laid on the diagonal. New drywall and trim. 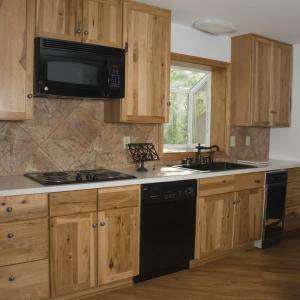 Now a warm farmhouse kitchen! 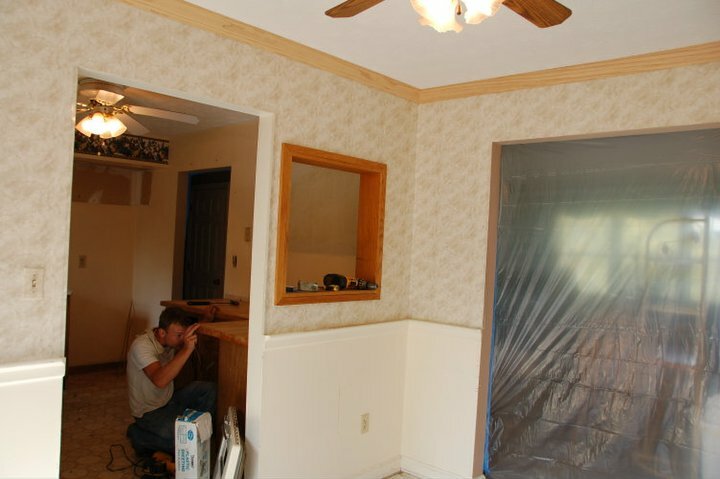 We gutted the room to the studs, did new drywall, trim, painted, and installed the luxury vinyl plank floor on the diagional. 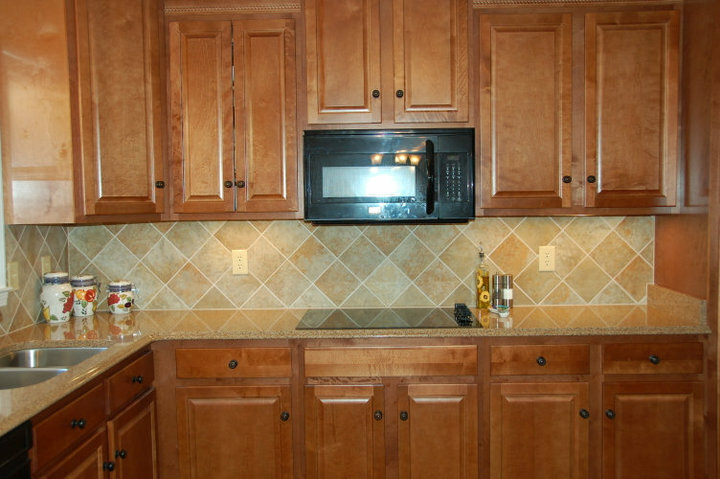 Old & stained lamiante top..
No backsplash. Dull and uninspired. 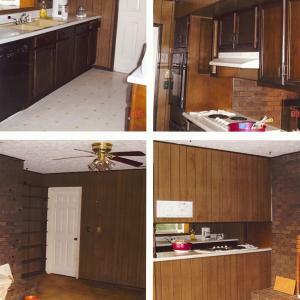 Here are some before photos of a job where the homeowner decided to replace their laminate countertop and add a new backsplash. 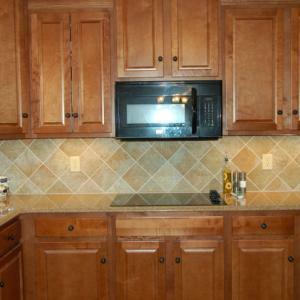 Backsplash is a 1"x 2" Noche Brick Split Face in a Tumbled Stone. 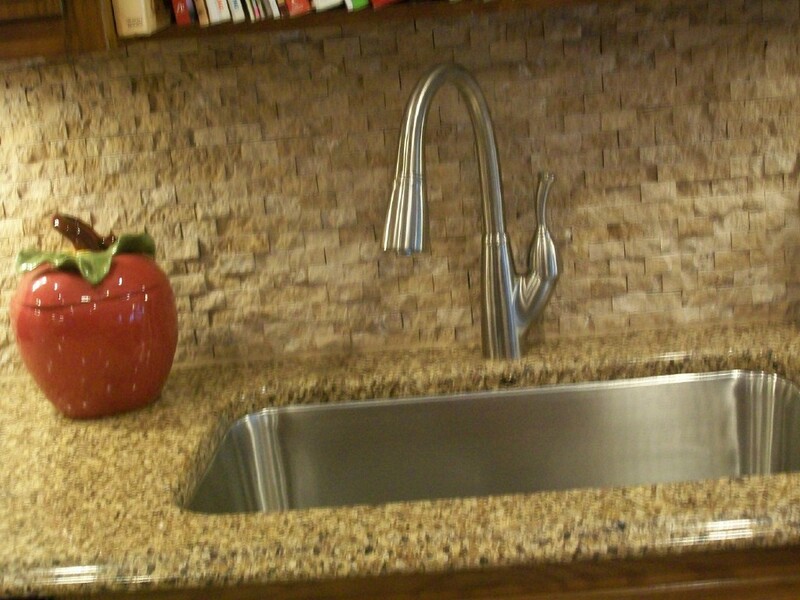 The Quartz Countertop in Brownhill compliments the backsplash perfectly. 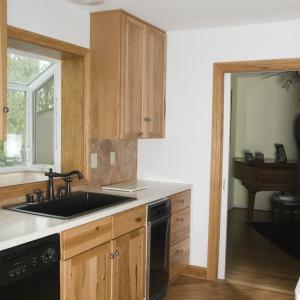 Just a few simple changes can make a kitchen warm and inviting. 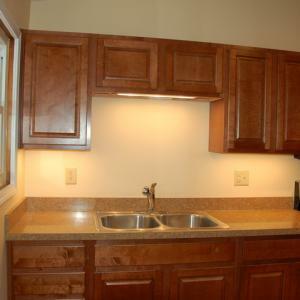 This kitchen had been so dark the homeowner called it "The Cave. 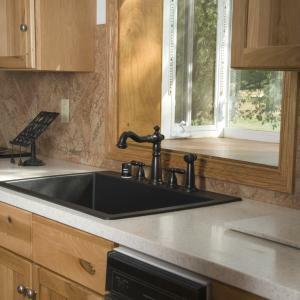 In a tight galley kitchen, a new layout doubled counter space. 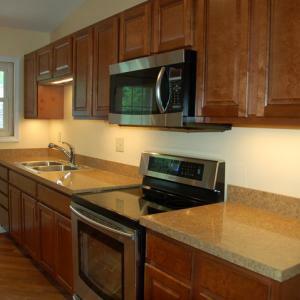 A conduction free-standing range and OTR microwave, with more appliances and counter on the opposing wall, made a small kitchen efficient and budget friendly. 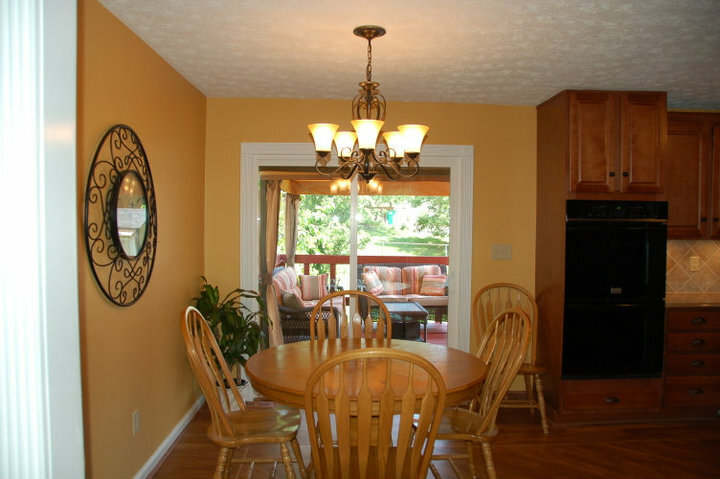 The Tiffany-style light fixture in dining area-turned office adds a little unexpected touch! 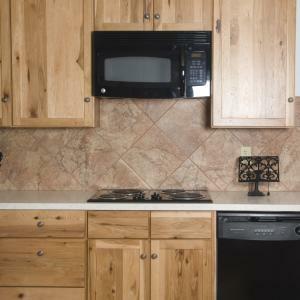 This homeowner had cabinets literally fall off the wall and had been living in a depressing work space for years. After another contractor had given her pricing with "allowances" (i.e., lowball estimate), she thought the appliances would have to be scrimped on. 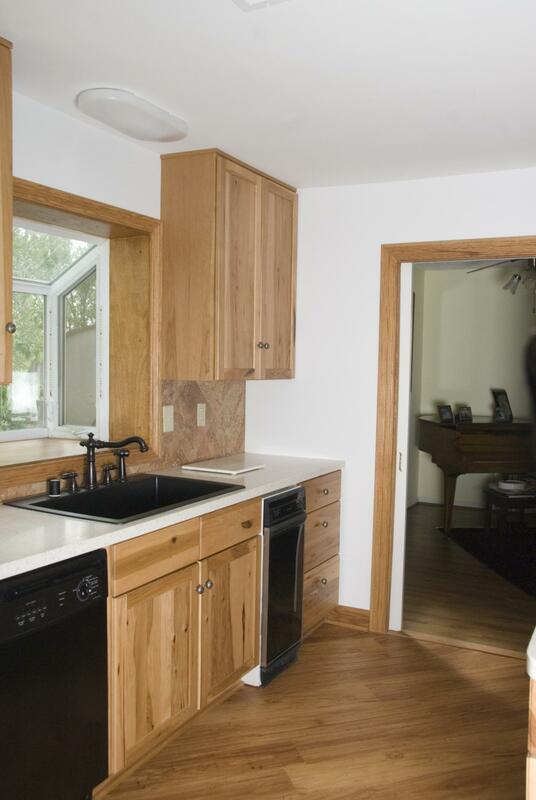 After we defined what she wanted and did a layout for a tough small space, the FIRM price came in low enough she upgraded to stainless with a double-oven-and-conduction cooktop, plus M/W, fridge, washer, and dryer. And was STILL only about 65% of the other quote she was given! Day 1 - Tear out starts. 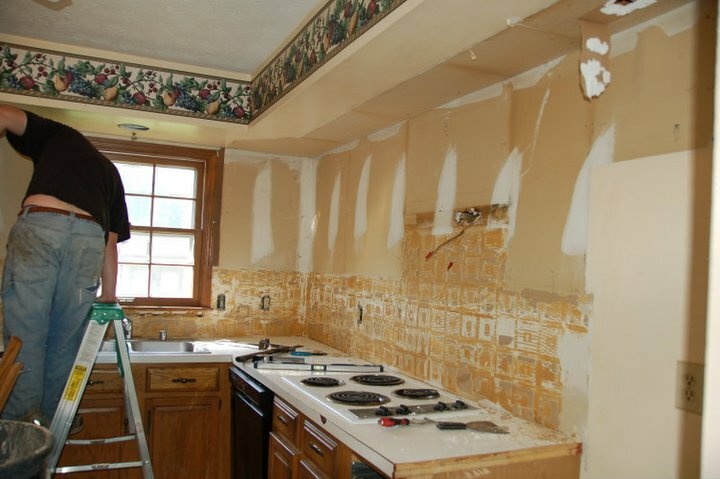 The wall between kitchen and DR was coming out for better design and comfort. 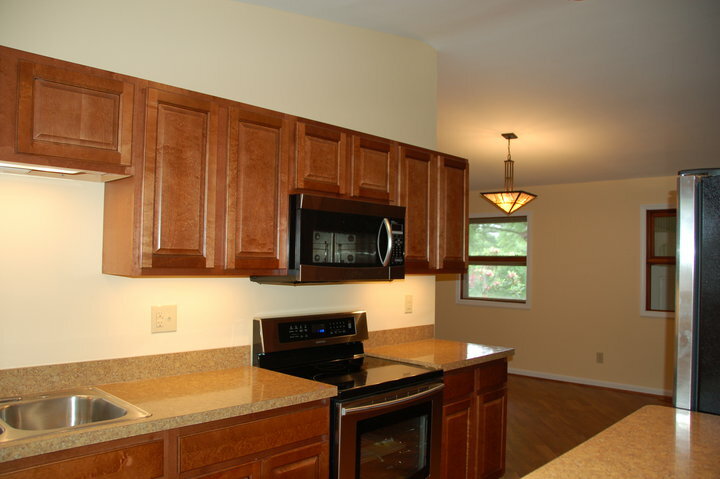 These homeowners had a kitchen that was past depressed! 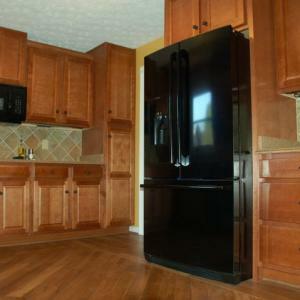 And a national chain had quoted them a price that about gave the homeowners a heart attack. Especially when they realized the national chain COULDN'T DO the entire job, and hadn't even suggested taking out the wall so the room would work. Hard to see in the thumbnail, but the floor has a tram line insert and is on the diagonal. From the space everyone hated, to the space everyone loves. Probably three times the storage space as before. 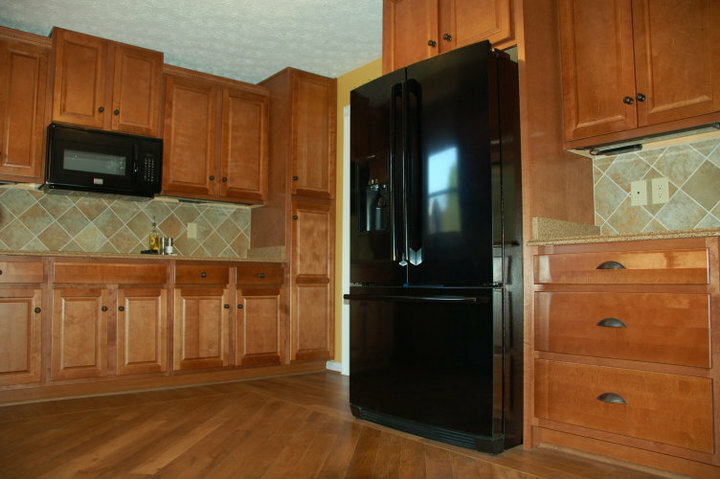 Pantry in the corner, a 3-drawer stack beside the fridge, and a cabinet over the fridge you can actually use makes it efficient for a family that is in the kitchen as the gathering area. 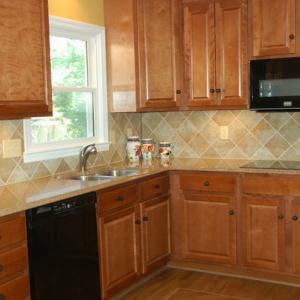 And the perfect tile for the backsplash! So, with ONE STOP the homeowners got ONE FIRM PRICE on dong more than the national chain quoted - but at only about 2/3 the price! But wouldn't you rather be here? 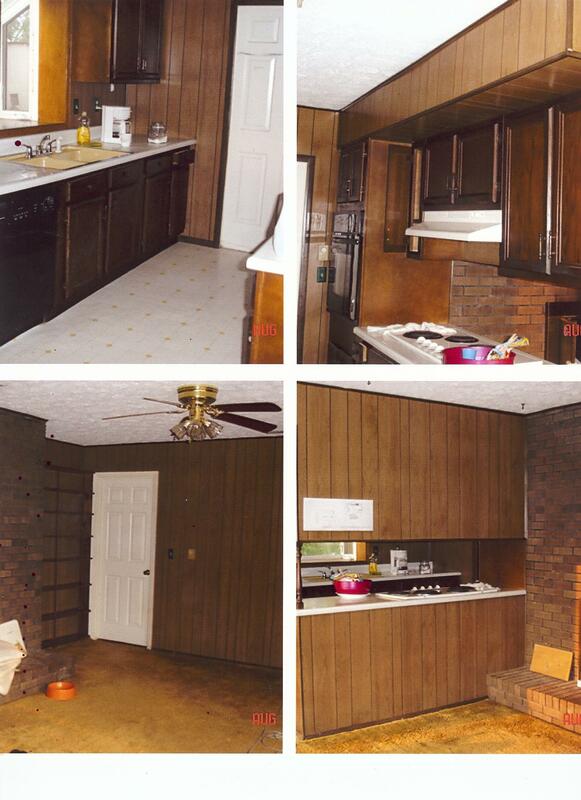 Great house in a wonderful subdivision - but stuck in 1968! 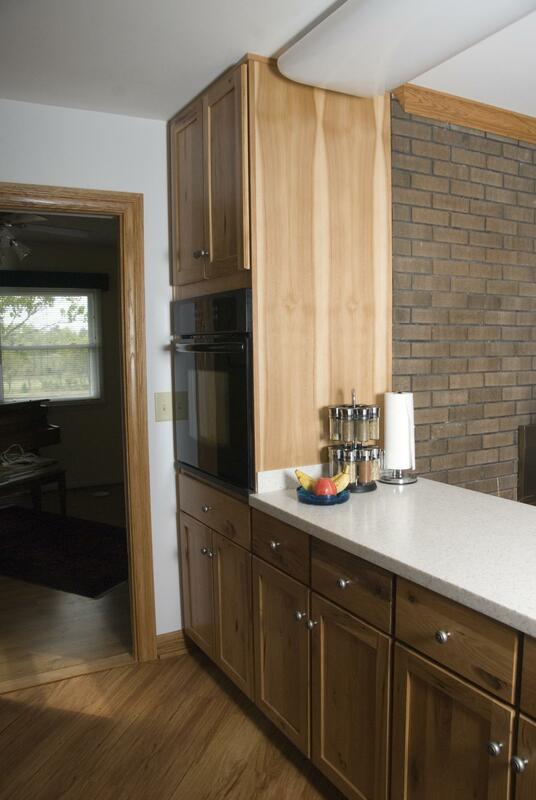 Really, are you THAT attached to remnants of a builder-grade kitchen, or wouldn't you rather have classic cherry? Or, you can clean up and go classic any time. 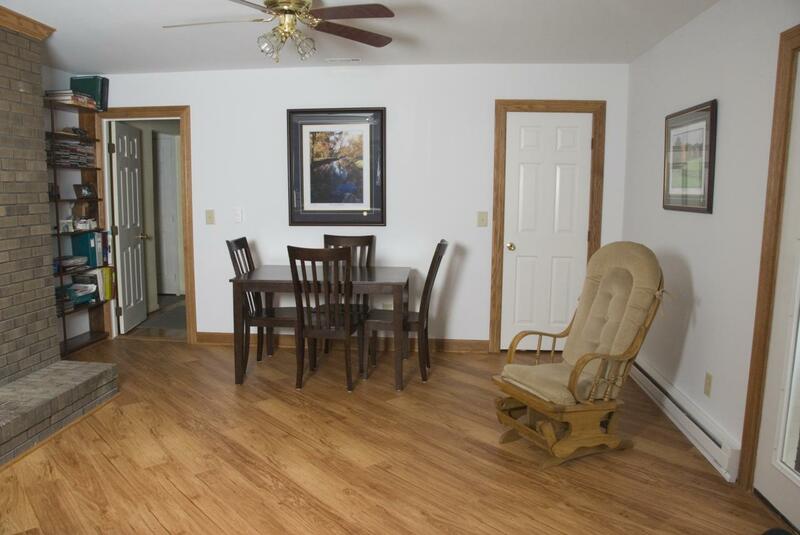 We fixed the water leaks on the walls and ceiling in the hall, too. 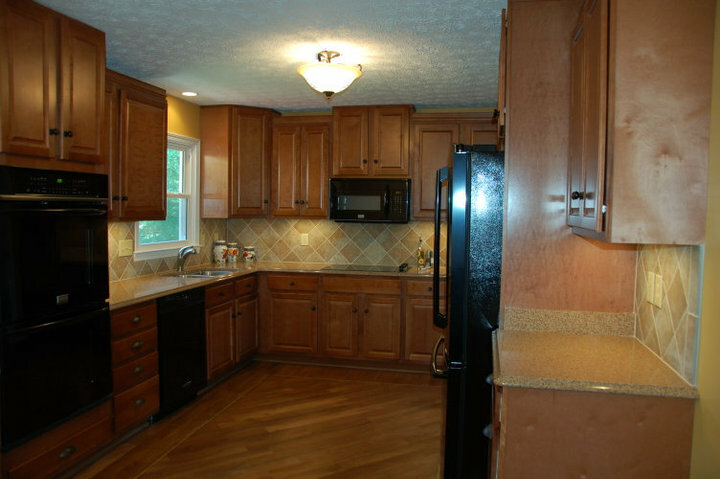 The low hanging cabinets cut off the kitchen from the family room. 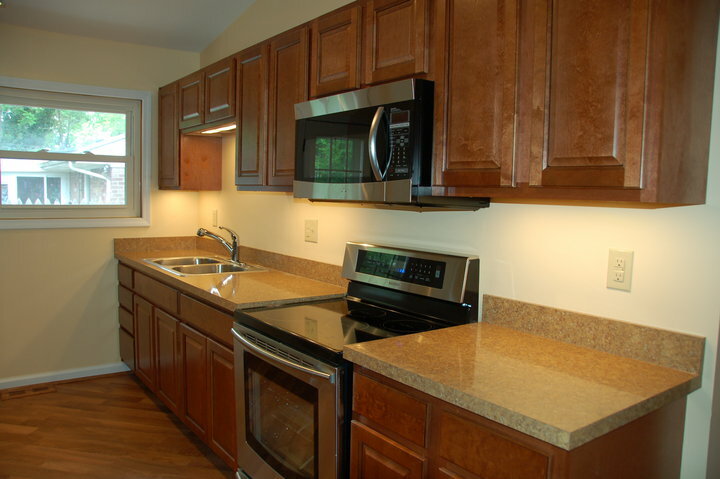 The family room and kitchen are now opened up for easy visiting between the rooms. The rest of the main floor got a makeover, too. Hardwood found under the living room and dining room carpets was re-finished. 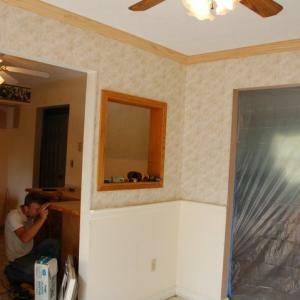 Old wallpaper striped, old ugly paneling torn out, new drywall and paint went in, along with hardwood that matches on the entire main floor. 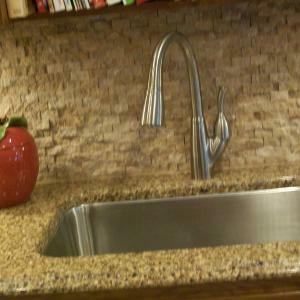 Backsplashes can be more than tile! Copper slate 4" x 4" tiles with a bronze plate. 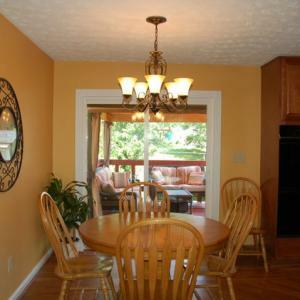 A homeowner who travels a lot, but calls a farmhouse home, loves surprising you when you round a corner in the house. Cutting down a cabinet, tossing a 30 year old worn out range hood in white in favor of a sleek stainless model, and adding a couple of bronze plates he liked added personal fun touches. 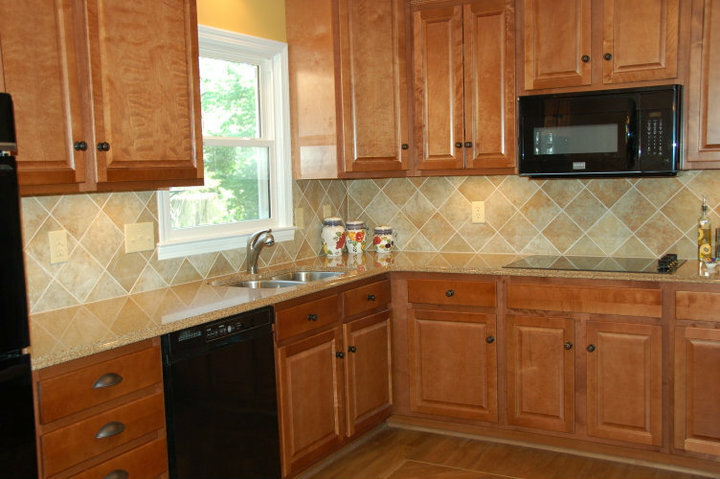 Want to display "before & after" photos of your project that Graham Flooring and Cabinets does for you? Let us know - and you are probably a better photographer than we are, so feel free to take photos!